As World Green Building Week 2018 approaches (24 – 30 Sep), we thought we’d share some of the most recent research on the social benefits of green buildings. This post is part of a series which will explain why we should all be aiming to ‘green’ our buildings, and furthermore, why we should be pushing government policy in this direction too. It’s not just the planet that will benefit from going green, there are economic and social benefits of green buildings as well as the more obvious environmental benefits. In fact, when discussing the benefits of green buildings, they are often broken down into the following three categories: environmental, economic and social. It’s for this reason that some people refer to these buildings as ‘healthy buildings’ as well as green buildings. This post will focus on the social benefits. According to the World Green Building Council: “[green buildings] provide some of the most effective means to achieving a range of global goals, such as addressing climate change, creating sustainable and thriving communities, and driving economic growth. 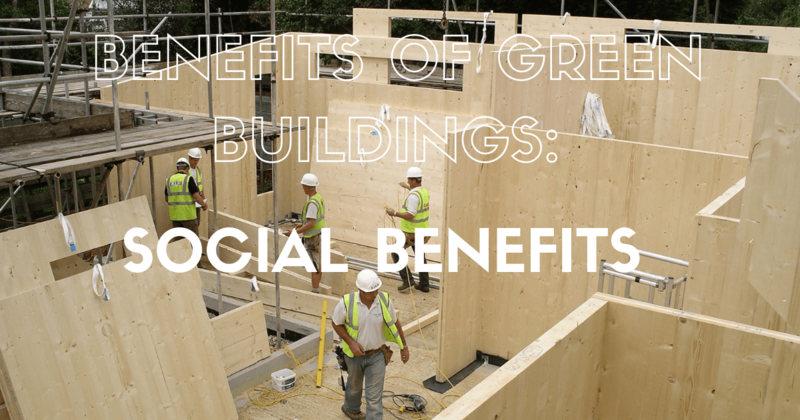 Lets look at the social benefits of green buildings. According to a growing body of research, the most important social benefits of green buildings are the enhanced health and wellbeing of those living and working in them. 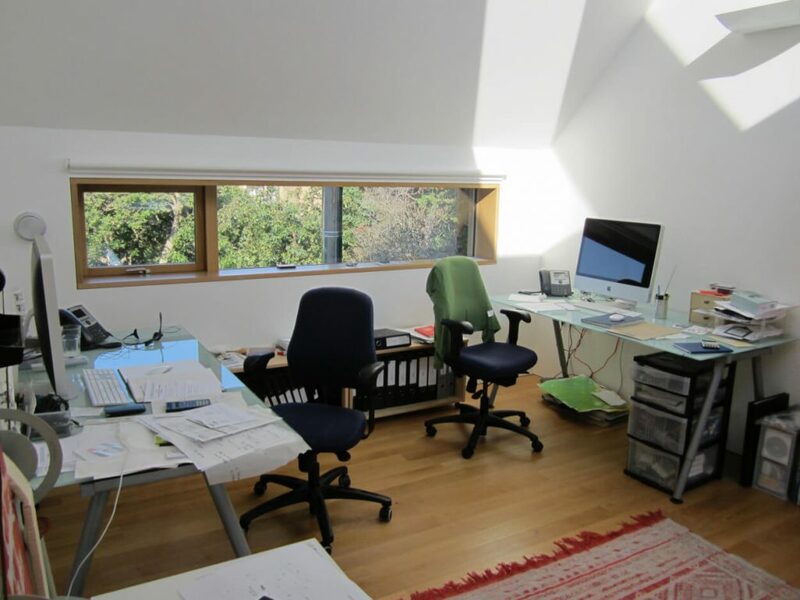 Koru Architects’ office – we work in a green passivhaus building with plenty of daylight. A 2016 study by the Harvard School of Public Health and the State University of New York Upstate Medical University (backed by United Technologies) found that those working in green-certified buildings had 26% higher cognitive function test scores than those in similarly high-performing buildings that were not green-certified. Interestingly, the effects lasted after they had left work: employees working in green buildings had a 6% higher sleep quality compared with those working in high-performing buildings that were not green-certified. In the same study, those working in green buildings also reported 30% fewer symptoms of ‘sick building syndrome’ – a condition typically marked by headaches and respiratory problems, attributed to unhealthy or stressful factors in an office working environment, such as poor ventilation. The same team is currently undertaking a three-year study to further gather data on the impact of green buildings on cognitive function. Backing up the sleep quality statistic above, the American Academy of Sleep Medicine, 2013 found employees in offices with windows slept an average of 46 minutes more per night. Estimates put the cost to the NHS of these hazards at £600 million per year, and the cost to individuals and society from loss of earnings, for example, at £1.5 billion per year. That’s a lot of avoidable illness, plus a big saving to the NHS purely from improving building standards. And while it might seem intuitive that being in nature would have a calming influence, a 2014 study researching Japanese ‘forest bathing’ revealed these calming effects can be replicated with indoor stimulations of a natural environment – the subjects’ blood pressure and pulse rate decreased, inducing a physiological relaxation effect. It’s more important than ever that we recognise the clear environmental, economic and social benefits of green buildings, especially since the government axed the zero carbon homes policy in 2015. So, if you are thinking of refurbing or building a property, make sure you engage a green architect for a sustainable design that’s good for you, your pocket and the planet. This post is part three in a series.